Warning: Building robots is dangerous and must not be attempted without great care. Everything shown & described here was conducted in a controlled, carefully monitored environment with multiple people keeping an eye on proceedings. For the last six months we’ve been wanting to use the drum on Catch Me If You Can – and this weekend we finally were able to! Well, we were able to… until Oddbot picked its moment to take another chunk out of our little featherweight… Only… somehow, it missed everything on the outside of the machine and hit the soft and squidgy bit in the middle – the Lithium Polymer battery. Now, things weren’t exactly going well for us at Extreme Robots in Gloucester this weekend. Rob started his Saturday doing laps of the Norfolk/Suffolk/Cambridgeshire countryside as one of his flat-mates happened to lock himself out – and then Rob’s car decided that the coolant didn’t belong in it….. I failed to find most of the parts in the boxes (despite repacking them carefully the previous weekend) and just simply wasn’t ready for show 1 on the Saturday. 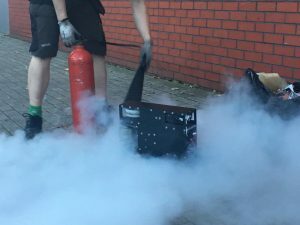 Catch Me If You Can vanishes in a haze of CO2 from a fire extinguisher! Sunday comes along and we’ve already seen a few spinners try (and fail to work), so we decided to swap the wedge out for the drum. I quickly span up in the arena just before the audience arrived just to prove it worked, then it was on to the show. Would anyone actually want to fight a spinner – even if we weren’t doing top speed? Turns out the answer was yes, but not everyone. The show was quickly restructured to allow spinners for one of the two featherweight fights. This allowed us more time for repairs if needed, and also allowed us to watch a bit more of the show. The first battle we only ran the drum up to 30%. It was doing damage, but mostly just scratching the paintwork of other machines. So we decided to take it a bit more seriously for show 2 on the Sunday – up to 50%. All was going well (and we were taking chunks off both other machines, and the arena floor & walls!) , until Oddbot managed to wedge itself in at an angle. We think he was probably going for our belts/drive system. Unfortunately, he missed and I was there thinking “please miss the battery, please miss the battery”… and for about 30 seconds I thought he had! Cease was called in that time, and then came the tell-tale wispy smoke. I have never seen the crew move so fast – and a big, big thank you to them for doing so. We got lucky, in short – only one or two of the cells on the battery actually decided to catch fire – and did so in a relatively safe way. Unfortunately, this means I now have a semi-flat battery that needs killing properly before I can dispose of it. On the flip side – I still have a robot! Lithium Polymer batteries are common-place in fighting robots these days. Indeed, they represent good value for money and also have a good power/weight ratio. Unfortunately, they’re also rather dangerous. Lithium-based batteries are often marked up quite clearly with marking such as “Do not dispose in a fire”, and also “Do not dispose in household waste”. There’s a very, very good reason for those warnings. It’s because lithium-ion based batteries become more unstable the more you charge them. That means a completely flat lithium-based batteries are relatively inert (i.e. won’t spontaneously combust). Unfortunately, the same cannot be said for a (part-)charged one. As we discovered yesterday….. This marks the end of our 2017 season battling at Featherweight level. We’ve got an Antweight World Series to go in a couple of weeks down at the University of Southampton hosted by a combination of their RoboSoc, ourselves and Dave Weston, and then that’s the end until April next year. We’ve still got things going on…. so watch this space.